Italy: Giuliani, Boattin, Adami (46'Bergamaschi), Linari, Guagni (29 'Bartoli), Giugliano (63' Parisi), Galli, Cernoia, Bonansea (83 'Serturini), Mauro (63' Tarenzi), Sabatino (76 'Rosucci ). A disp: Marchitelli, Gama, Girelli, Giacinti, Alborghetti, Pipitone. All: Bertolini. Ireland: Hourihan, Connolly, Scott, Quinn, Fahey, Toland (91 'Whelan), Kiernan (71' Barrett), O'Sullivan (80 'Jarrett), Mccabe, Campbell (73' Caldwell), O'Riordan. A disp: Moloney, Ziu, Farrelly, Foley, O'Mahony. All: Bell. Referee: Sara Persson (Sve). Assistants: Josefin Aronsson and Ayse Bozkurt (Sve), Official Fourth: Ilaria Bianchini (Ita). Score: 4227 viewers. warned Fahey (I). After the draw with Poland, the Italians return to victory against Ireland, in the beautiful setting of the Mapei Stadium in Reggio Emilia, wrapped in the warmth of over 4000 spectators present. Against the Northern European national team, the girls of Milena Bertolini start with the handbrake on and the guests take advantage of it by attacking the blue ball carriers and finding the net of the advantage after only three minutes of play. Defense not an exile from faults with the new central duo formed by Linari and Galli tucked into the most classic fast-throw action. Coach Bertolini proposes some variants to examine every solution in view of the world cup. Gama, Girelli and Giacinti remain at rest, Boattin returns to the left on the left and Adami joins Cernoia and Giugliano from the first minute. The Irish goal is a cold shower for the Italians who take a little time to react and take a threatening lead in the opposing half of the field. Moreover at 29 'Alia Guagni, one of the most ball players up to now, is injured in an attack action and is replaced by Bartoli. Paradoxically, it is from the half-hour that the Italians grow and press the accelerator and go very close to the goal with Mauro: from the Cernoia flag he drops on the head of the purple striker who flies perfectly, but on the goal line Cambpell replaces his goalkeeper and foils . The network, however, is only postponed: at the 41 'Giugliano recovers the ball and quickly restarts the action giving the ball to Bonansea who first invents a serpentine, taking the Irish defense for a walk and then a film archive goal shooting a fireball from the limit, direct at the intersection of the poles. The Juventus striker's network allows the Italians to close the first half on the 1-1. The resumption of the game sees the blue press with vehemence immediately. Bergamaschi, entering Adami's place, becomes dangerous at the first round of hands with a cross shot that almost baffles Hourihan, forced to take the ball to remove the ball from the far post. The thrust of ours is rewarded at 9 ': Bartoli goes to the cross, Sabatino literally throws himself on the ball and enters behind the Irish goalkeeper. Guests have a reaction to the 12 'with Kiernan's shot from outside the box calling Giuliani to intervene in two stages. The two technicians begin the usual waltz of the alternations, for the Italians enter Parisi and Tarenzi for Mauro and Giugliano. Kieran at 23 'forces our n. 1 to the corner deviation, while shortly afterwards ours are close to the net with Sabatino who, fed by Bonansea, kicks from an excellent position without too much strength and Hourihan foils with the scarpino. 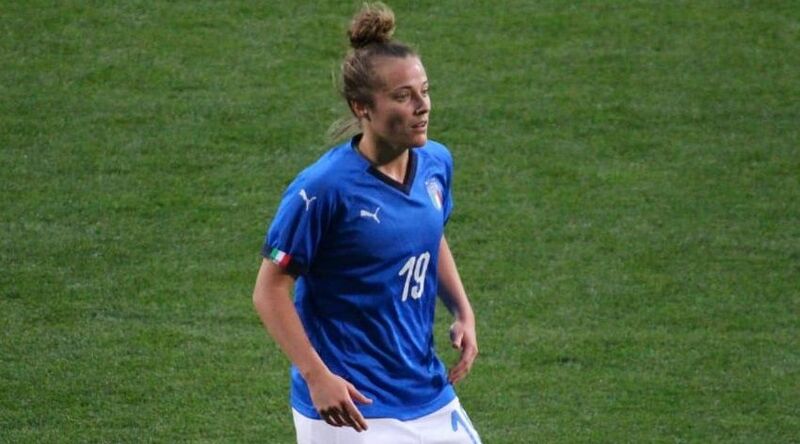 At the half-hour the whole stadium welcomes with an ovation the return to the field of Martina Rosucci. As the minutes pass, the race drops in intensity and only in the final do the Irish create some headaches for the blue, showing themselves to be brighter than ours. Thus, with the measure of success for the landlords, a beautiful and pleasant competition ends, full of interesting ideas that Milena Bertolini will certainly have noted in the notebook. Mapei's over 4000 applauds, including an amused Roberto Mancini, smiling in the stands, flanked by Luigi Di Biagio and federal leaders.